Valid Coffee Direct voucher codes - save up to 12% at CoupoRando! Are you one of those people who just can't get going without a coffee in the morning? Coffee Direct is the place for you! With a Coffee Direct voucher code you can enjoy fantastic savings on a wide range of coffees, teas and more. So whether you're a caffeine fiend for whom only the strongest will do or a milder palette with a taste for teas and decaffeinated blends, a Coffee Direct voucher will help you get your fix for less. Coffee Direct was established in 2007 to provide freshly roasted coffee to the nation's caffeine fans. With a history in the coffee industry stretching back over 25 years, their team has plenty of experience in importing and roasting quality coffee from all corners of the globe. Coffee Direct works with an extensive network of buyers which allows them to offer what they consider to be the very finest collection of coffee beans, freshly roasted to order. Because coffee starts to lose its freshness as soon as it is exposed to fresh air, they believe that only roasting coffee as it's required is the best way to offer their customers the best finished product. Their coffee is then immediately packed in specially designed bags, stopping air from getting in and keeping the product fresh unopened for up to 9 months. At Coffee Direct's comprehensive online store, customers can browse a wide range of more than 30 coffees along with their own special secret blends, flavoured coffees, decaffeinated coffees, teas and more. Looking for the ultimate caffeine injection to kick-start your day? Coffee Direct have plenty of strong coffees to choose from, sourced from the best growers around the world. Or perhaps you're after something a little milder? Their blends offer something to cater for every taste, while their range of teas covers everything from black tea, green tea, fruit teas and more. Coffee Direct understands that everyone has their own favourite way of brewing coffee, which is why they offer products to suit every one from Turkish blend coffee to whole bean and everything in between – simply choose how you would like your coffee prepared when placing your order. As well as coffees and teas, Coffee Direct also offers a range of fantastic gift hampers that are perfect for everyone from coffee connoisseurs to those just discovering the wonders of coffee for the first time. And with their fast and efficient delivery service, you can be sure your coffee fix will arrive at your doorstep in record time. 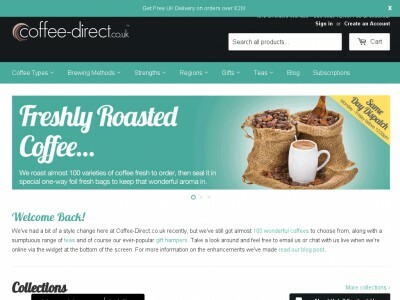 Want to get shopping with Coffee Direct? With a Coffee Direct voucher code you can enjoy great savings on their wide range of products. So whether you're buying a treat for yourself or a gift for a friend, a Coffee Direct coupon will save you money while you shop. Wide selection of blends and flavoured coffees. Browse our website until you find a Coffee Direct coupon that suits you, then navigate to their website to begin shopping. Choose a grind and click 'Add to cart' to buy. Click to enter your Coffee Direct voucher code. If you've enjoyed shopping at Coffee Direct, you might also like to check out more great deals at stores like Tesco and Ocado. Or, if those aren't right for you, you'll find plenty more deals to browse in our Food and Drink section. Click 'Pay by credit/debit card or Paypal'. Coffee Direct offers a choice of delivery options to suit your budget and time constraints, with free standard UK delivery available on all orders over £20. Need to speak to the team at Coffee Direct? 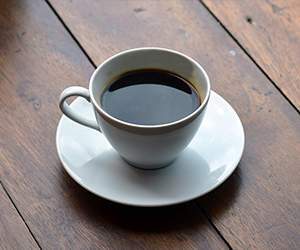 Whether you have a question about your order, want some advice on choosing the right coffee blend or simply want to find out more about how you could make big savings with Coffee Direct voucher codes, you can contact the Customer Services department by accessing the online contact form here. Want to discover more about freshly roasted coffee beans with Coffee Direct? The company maintains a profile across your favourite social media networks. Follow them for access to lots of exclusive content including coffee news, promotions, competitions and more. You can also use these pages to find out more about saving money with a Coffee Direct voucher. Don’t forget to check them regularly, as you can never be sure when free Coffee Direct voucher codes might be waiting for you! Buy now online at www.coffee-direct.co.uk.